Where can I store my luggage in Milan? Whether you’re catching a football match at San Siro Stadium or taking a tour of the Duomo Cathedral, you probably asked yourself: Where can I store my luggage near me? You need both hands to embrace everything Milan has to offer, so why not drop your bag off instead of dragging it around? From luggage lockers to manned left luggage offices, Stasher has got you covered. Stasher has hundreds of luggage storage locations worldwide and a dozen in Milan alone - every luggage storage location has been personally vetted by a member of the Stasher team to ensure that the same high standards exist across all StashPoints. ✔️Each item is insured up to €1000, giving you that added peace of mind. How much does it cost to store your luggage in Milan? It’s just 5€ per day, and 5€ for any additional day. Where are the StashPoints for my luggage in Milan? Our StashPoints are conveniently located within walking distance of Milan’s main attractions and areas of interests. 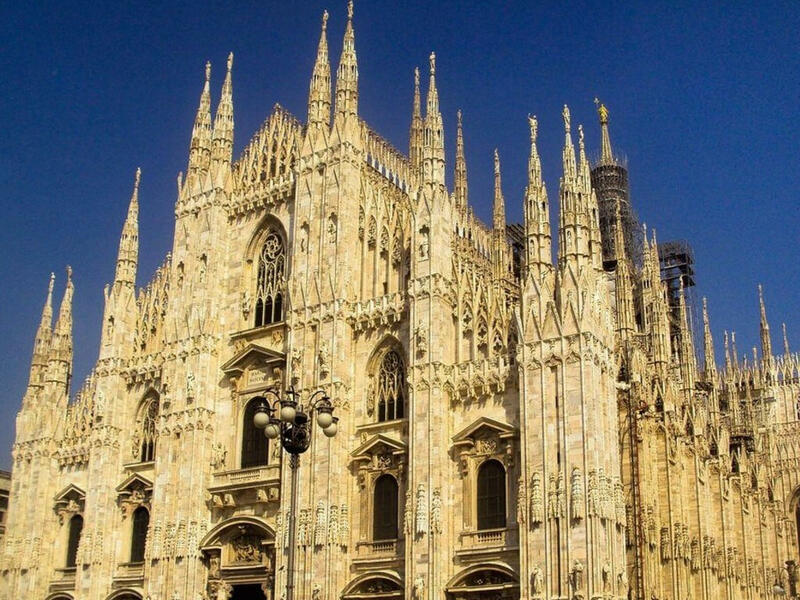 From Milano Centrale to Duomo Cathedral, we have luggage storage locations far and wide to ensure you always have somewhere nearby where you can safely store your bags. Go for an aperitivo, catch a show at the Scala Opera House, take a stroll among the Duomo spires, the city is at your fingertips. Have a problem with your booking? Our award-winning customer service is always on hand to help you out. Now that you’ve stored your luggage It’s time to explore everything Milan has to offer. World-renowned for its fashion-forward attitude and Fashion Week, home of Leonardo da Vinci and the breath-taking Duomo, Milan is Italy's city of the future. Take a look a The Last Supper, have a traditional Italian aperitivo and let yourself be swept away by the beauty surrounding you. While Stasher luggage storage facilities are 50% cheaper than the traditional train station services, you might still want to check out the other alternatives available. Where can I find luggage storage near Milan Central Station? There is a manned left luggage facility at Milan Central Station operated by KiPoint, located on the ground floor, in the new connecting pedestrian axis, towards Piazza Luigi di Savoia. Bear in mind: there are usually long queues to drop off and pick up your bags. If you are in a hurry and don’t want to spend up to an hour waiting, we recommend checking out other services. Open everyday, 6a.m. - 11p.m. The station has a “Galleria Commerciale”, a shopping area with plenty of stores, cafes and restaurants. Rest assured you won’t get bored if you have to spend a few hours here. It's a 35-minute walk from Milan Centrale to Milan Cathedral and the beautiful 19th-century shopping mall, the Galleria Vittorio Emanuele II. If you’d rather use public transport, take the Yellow Line (M3) and get off at Duomo. Where can I store my luggage at Milan Malpensa Airport? A monitored baggage storage area can be found at Milano Malpensa Airport by the Arrivals area B at Terminal 1, level 0. No luggage storage available at Terminal 2. Open daily from 06.00 to 22.00. It costs €3.50 for a small item, €4.00 for a larger item for each 24 hour period. Malpensa is Milan’s main airport and it has two terminals. All easyJet flights depart from Terminal 2. The Malpensa express train service runs directly from Terminal 1 to Piazza Cadorna (red metro line 1, Cadorna stop) or to Central Station (Centrale). It takes slightly under one hour to get to Milan Central Station. Where can I find luggage storage near Milan Linate Airport? Milan’s second airport, Linate, has left luggage facilities on the ground floor, in the Arrivals area. It is open every day from 06:30 to 21:30. The best way to travel to and from Linate is either by taxi or bus. There is no train service. There’s a frequent bus running from the airport to Piazza San Babila (city centre). Head here for more info.